Krakow is a children-friendly city. Kids are welcome by definition almost everywhere–tourist sights, museums, hotels, restaurants, cafes, shops, etc. Obvious exceptions are places of grown-up entertainment, from pubs to nightlife spots to casinos. At the same time parents or other chaperones are expected to take full responsibility for minors in their care and make them behave (albeit the locals, in Krakow and in Poland generally, are pretty tolerant towards romping children: ‘kids are kids’). Children rather like Krakow too. The city’s historic monuments fire their imagination and other attractions are plentiful enough to keep them happy. Kids enjoy the compact Krakow zoo, situated in the middle of the vast 500-hectare Las Wolski forest, turned to municipal park in 1917, some ten kilometers west of the city’s central Old Town historic district. Its seventeen hectares accommodate over 1400 exotic animals, in that number some 600 birds and 400 mammals, representing 285 species, 32 of them on the verge of extinction and 88 endangered. Its most prized possessions include herds of pygmy hippopotamus, white camel, sea lions, several species of wild cats and rare antelopes, while the zoo’s Reptile House features dwarf caimans, lizards, turtles, snakes, amphibians, invertebrates and exotic fish. Krakow’s sizable water-park complex, Park Wodny, at 126 Dobrego Pasterza street – some five kilometers northeast from the city center – proves a year-long magnet for kids who relish its huge slides, whirlpools, and other wet joys. Recreational area most popular with parents and their offspring has been traditionally Park Jordana next to Krakow’s huge downtown Blonia common, just west of the Old Town. Its playgrounds, pitches and the like complement the usual park facilities. Six-hectare Stanislaw Lem Science Garden (Ogrod Doswiadczen im. St. Lema) at 67 Al. Pokoju avenue, opposite M1 shopping center, provides a series of some 60 interactive plays with ingenious devices that demonstrate the laws of physics. Open from May 1 through October 31 between 9 a.m. and 7 p.m. There are English and Polish instructions and explanations. Numerous Krakow enterprises provide entertainment for kids, either exclusively or as important part of their clientele, from play centers to amusement arcades to multiplexes to museums, and even the Krakow Opera Company caters to minors from time to time. 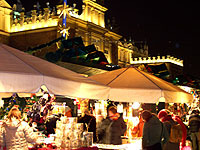 Krakow lacks a permanent amusement park but it's just an hour's drive to Poland's top theme parks. And from spring to autumn various funfairs are enduring feature in the city. Their favorite location is the site near the Most Grunwaldzki bridge, close to the Wawel Royal Castle, on the opposite bank of the Wisla river. The city boasts an IMAX cinema, situated in the Krakow Plaza shopping center at 44 Al. Pokoju street, that also shows three-dimensional movies, documentaries ones as well as full-length features. Plus, every day children’s films are screened in each of Krakow’s several multiplexes yet foreign productions are always dubbed into Polish. Krakow has a repertory puppet theater, Groteska at 2 Skarbowa street, close to the Old Town, that stages mostly children’s plays. Also the city’s other theaters occasionally put on productions of shows meant for schoolchildren. From October through June the Krakow Philharmonic Orchestra regularly gives special concerts for children in its Filharmonia concert hall at 1 Zwierzyniecka street that abuts on the Old Town two blocks north from the Wawel Royal Castle. 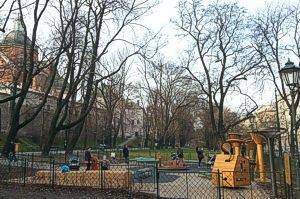 Note: Public playgrounds equipped with play apparatus for kindergarten-age kids are situated in the Planty gardens on the eastern and the western sides of Krakow's Old Town central historic district, next to Hotel Royal and the Archeology Museum respectively. There are over 25,000 beds to choose from.